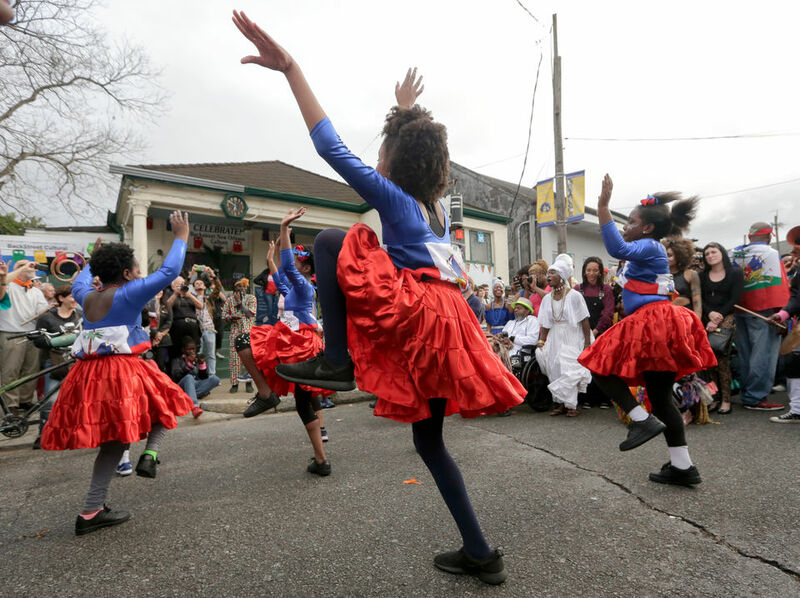 The second annual Krewe du Kanaval parade, a Haitian-inspired Mardi Gras march, cut a colorful path through the crowded French Quarter on Friday (Feb. 22). The krewe was founded in 2018 by New Orleans’ resident husband and wife rock stars Win Butler and Régine Chassagne of the band Arcade Fire and Preservation Hall Jazz Band frontman Ben Jaffe. In the unseasonable afternoon warmth, dancers, musicians, flag-bearers and costumed members of the krewe poured from the One Eyed Jacks nightclub, where a pre-parade reception had taken place, onto Toulouse Street. The colorful cluster was less than a block from the rollicking Krewe of Cork parade that filled Royal Street from curb to curb. Led by an ominously costumed member of the Northside Skull and Bones Gang, the Kanaval paraders set off toward Armstrong Park. Choreographed dancers strutted and fluttered amidst the antique architecture in long Caribbean dresses. The beat of drums, blasts from long tin horns and the hiss of maracas rose to the gray sky. The Preservation Hall Jazz Band, decked out in startlingly pink suits, added brass riffs to the joyful cacophony. Butler, who was a head taller than most paraders, sang sporadically into a toy megaphone as he marched. The Kanaval parade is meant to illustrate New Orleans’ important historical link with Haiti. In the early 1800s a tide of immigrants fleeing a slave revolt in what is now Haiti doubled the population of New Orleans, leaving an indelible mark on the city that is sometimes been described as the most northern outpost of the Caribbean. Kanaval is the Haitian translation of Carnival. Chassagne, who led a twirling dance troupe in the center of the parade, is the daughter of Haitian immigrants to Canada. Funds raised at the Kanaval Ball (which was scheduled for Friday night) benefit Haitian causes. After the parade passed through the arched gate of Armstrong Park, a brief presentation took place on a stage at the edge of Congo Square. The Krewe founders introduced this year’s king and queen, bounce pioneer DJ Jubilee and renowned chef Leah Chase. Chase’s son Edgar L. Chase III, explained that his mother, who is 96 years old, was unable to attend do to health reasons. He said that she was recovering from an illness and had been released from the hospital earlier in the day. A representative of the mayor presented a proclamation declaring Feb. 22 to be Caribbean Carnival Day. After a round of spirited dancing, the Krewe du Kanaval reformed and set out again to travel the paths inside Armstrong Park. The Carnival event is meant to commemorate New Orleans’ historical bond with Haiti. Before Friday’s parade, Krewe du Kanaval had declared that their procession would take place entirely within Armstrong Park. Preservation Hall Foundation Executive Director Greg Lucas said that the krewe was granted a city permit to gather in Armstrong Park, but not to parade. The krewe had not intended to parade through the French Quarter streets, just to travel by sidewalks, Lucas said.